You’ve probably heard me mention once or twice now that I lost both of my Grandmas within just a few months of each other. The majority of the furniture and the old farmhouse and the whole renovation journey started with the passing of my mom’s mom (Grandma Charlotte) whose farm house I renovated and is now mine. My dad’s mom (Grandma Eleonora) was not what I would have called a hoarder (she just knew how to keep a lot of things) so my dad and his siblings told all of their kids to head over there and pick what they wanted. This rocking chair was one of the pieces I chose and got to keep! 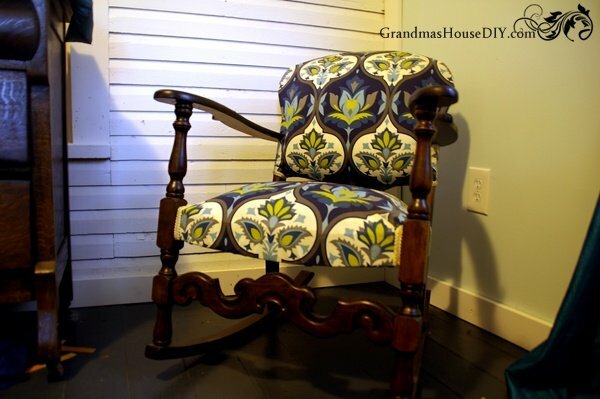 This is an old rocking chair that I’ve run into time and time again on pinterest so it is not an uncommon rocker. However, I have not yet seen one with the same wood design as mine, but the shape and general idea is the same. I had never reupholstered anything before so this was a real learning curve for me because there was no way I was going to keep that ancient pinkish fabric, eeeww. I also wanted to sand it down and stain it darker but this old rocker did not take stain very well nor did it sand well, nor was it worth it. I should have just added another coat of poly to the wood and called it a day but, ya live, ya learn, ya know. All I can say is that this turned into a much nastier and messier project then I had ever anticipated. The seat was full of some kind of straw and stuff that became like dust and the amount of staples and nails used on all of it was absolutely mind boggling. After two hours of pulling staples and an entire garbage bag full of the incredible amount of stuff that it had been stuffed with, it was ready to be remade and I was ready to never see it again. 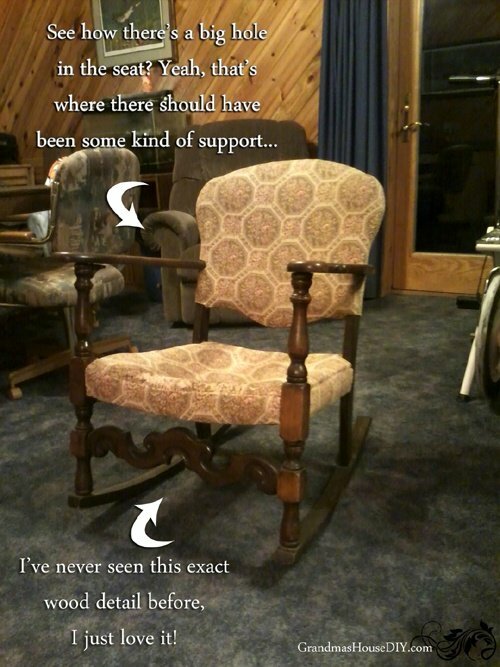 At some point in this rocking chair’s life it lost the support that had been in the seat. This rocking chair is bigger then it looks and it really needed something besides fabric for that big seat so I picked up a bunch of 1x2s and cut them down to size and covered the seat with a bit of a gap between them, I did the same with the back of the chair too. From there I covered it in batting and chose the coolest fabric that I could find…. Its not very cool is it? Yeah… well… Admittedly I should have looked harder but my little home town only had so much to choose from. Its ok…. I guess… but I suppose I will probably redo it someday… As for now though I’m pretty happy with the fabric on this old rocking chair, it should did brighten it up a bit! Taking a cue from This Awesome Blog I used trim to cover up all of my seams (hot glue guns are AWESOME, never mind the burns) and basically I just stretched the fabric and stapled it down. What I would do different now that I’ve done this. I would spend more time picking out fabric. I would NOT stretch my fabric so tightly. I don’t know why I thought it had to be as tight as possible but no, it doesn’t need to be stranglehold tight, I figured this out after I had already screwed up the seat. Oh well. I will fix it someday but, for right now, I like it fine 🙂 And I think Grandma Eleonora would be really happy with her old rocking chair! This turned out fabulously! What a difference the bright print makes. Thanks for adding your creativity to the Thursday Favorite Things Blog Hop! 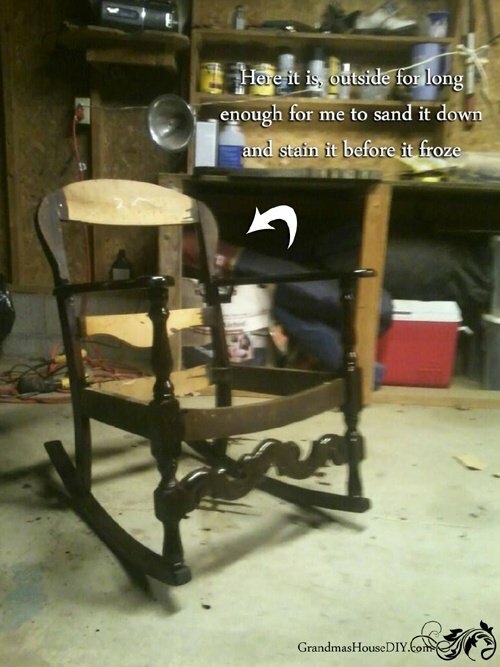 Great job on your rocking chair, I have as similar one that belonged to my MIL, I need to reupholster it, I have the material but it seems there are to many other things pressing in the spring to do. Thank you! Yeah there’s always so much to do in the spring 🙂 We’ve still got a couple of weeks before spring officially gets this far north but I’ve already made to-do lists! your rocker has turned out wonderfully, I really like the fabric. your blog looks interesting, I’m off for a look around as I love old houses! Great thanks for stopping by! I love the fabric you chose to redo your chair. Very pretty. Thank you! I wasn’t so sure about it right away, it was the closest I could find to my vision of what I wanted but it has definitely grown on me! 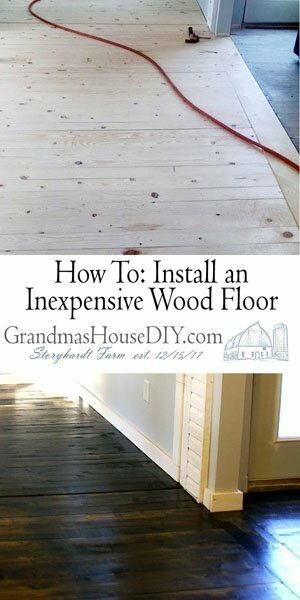 I’m new to to your blog but think you are the sweetest thing to take on these projects to keep your grandma’s things and update them for your old/new home. I came over from Vintage Charm- it’s nice to meet you, Tarah! Oh thank you so much! Its really been a wonderful labor of love 🙂 Its great to meet you too – I love your blog! I think your chair turned out amazing! I admire you for taking on such a difficult reupholstery project. We never know what surprises are under old fabric. The new fabric you chose is fun and fabulous! Thanks so much for sharing at Vintage Charm. Thanks so much! I definitely went into to pretty darned scared of the whole project, I was so relieved it turned out ok! Thank you! You’ll definitely see me there! Sometimes the projects we think should be the easiest and simplest turn out to be the hardest with the biggest headaches 😉 You learned so much from this though and in the end produced a pretty fantastic makeover! Well done! It looks lovely! You should be proud of it.. it is a special piece. Your grandmother would be proud! If you are at all interested in joining in one more weekly party, I host Making Broken Beautiful over at the Curator’s Collection. It runs every Thursday thru Sunday and is a furniture and home decor party. I would be happy to host your talents! You do lovely work! I hope you have a great weekend! Terry thank you so much and for coming by! I’ll definitely go check out Making Broken Beautiful, sounds like a place I would fit right in 🙂 Thank you! I’m so relieved it turned out well! I still think I might change up the fabric one day but, for now, I love how bright and funky it is! Amazing job! The fabric complements the stain color of the chair, very nice. Wow, Tarah, what an amazing transformation! You certainly have an amazing talent! I don’t think I could even begin to take on such a project! Thank you so much for sharing this over at the Celebrate Your Story! link party! I am pinning this one to my Crafty furniture board! Oh thank you very much!! 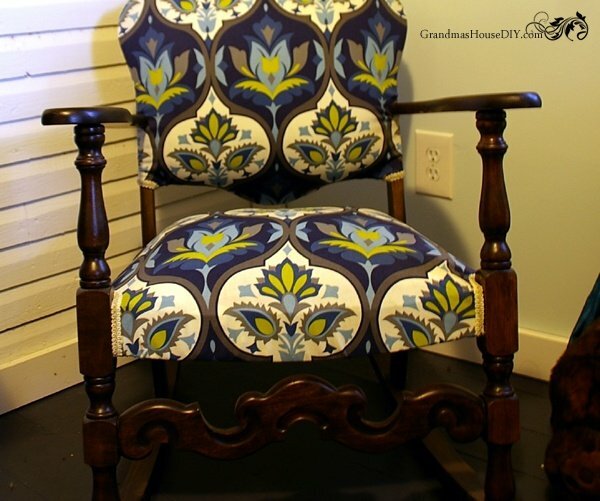 Love this chair and the fabric you picked! Beautiful! I’ve seen a couple of your posts. I would love to see pictures of the backs of your pieces (especially the rocker). I’m toying with the idea of reupholstering a chair and would be interested in how you finished the back. The back is a solid piece of fabric stretched and stapled around the edges and cut to size, then the edging/staples I just covered up with that pretty little trim and lots of hot glue 🙂 Thanks for coming by!! This is a cool rocking chair!! I’m glad you took the time to restore it. You did a great job on this! Thanks for sharing at Sweet Inspiration! You did a great job! Thanks for sharing at Meet up Mondays! Oh thank you so much! I would love it if you featured it!! It looks absolutely gorgeous now! Great DIY. Thanks for linking up with us on Welcome Home Wednesday! Love the fabric and think it turned out great! Wow! That came out amazing. I love your story. Each piece of furniture has a meaning and a sentiment and you are breathing new life into it. It is just beautiful. Can’t wait to see what you do next. So true, every piece carries a story with it, I love that I think of my grandma so often and I get to keep and make beautiful again something of hers. Thank you Melissa! Wow – what a difference! How did you fix that seat?? Thanks for sharing on the DIY party! After ripping off the fabric I discovered there was no actual support for the seat so I bought some really thin strips of wood and just ran a few of them over it for support tacking them down with nails 🙂 Thank you for coming by! Thank you so much Mimi! I don’t know if I’ll be tackling any upholstery jobs again any time soon but it was definitely worth it! How goregous this is. 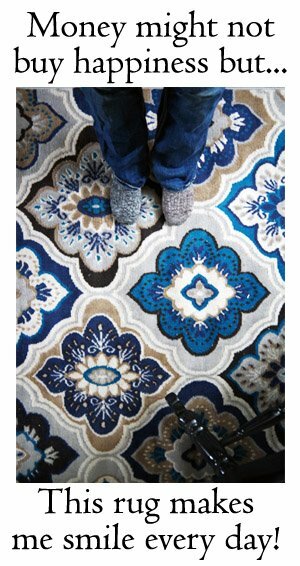 I love the pattern you chose and the colors are vibrant. Nice work. I bet it is comfy to sit in too. Rocking chairs are so relaxing. Thanks for sharing your masterpiece with us at my party this week. I think the fabric is beautiful. This is an amazing makeover. I am happy to read your tips, I have a chair I am thinking about, but I am a little afraid and a little hesitant. Thanks so much for sharing this at Celebrate Your Story! This one really scared me because it was my first try at fabric anything but I figured I had to try! lol thank you so much for coming by! Wow I think it looks amazing! I love the fabric you picked. I would be scared I would have done irreversible harm, but you totally NAILED this. Great job! Thanks for linking up over at the Happy Now! Thank you SO much Jen!! Tarah, I love the fabric you chose and the color of the wood is luxurious. Great Job. Sylvia D.
Thank you so much Sylvia! I love making over furniture and you did a fabulous job with this makeover. Thank you for linking up at Funtastic Friday! Thank you Lacie! Its so much fun to see an old piece get new life again! I’ll be there! Thank you Ashleigh! This is a beautiful transformation-I just love it-shared it too! Thank you for joining us at TOHOT! Jemma, thank you so much!! What a gorgeous transformation. Thank you so very much for sharing this wonderful post at Thoughts of Home on Thursday. I love that you saved something old but made it your own. I love the bright colors in the fabric you chose. It really looks so much brighter and more fun than the old pink stuff. Great project. Thank you so much for sharing to the Monday Mish Mash. What a great re-do!! I love it!! Thanks for sharing on My 2 Favorite Things on Thursday!! Hope to see you again this week!! Pinned! I have to say I love the fabric – but then I’m a Grandma, lol! I really like that you talked about some of the learning process – and what you can get into!! Thanks for sharing with us at Throwback Thursday! Like previous commenters, I actually love that fabric. The chair looks fantastic. Awesome job! Did I understand it correctly that you made a support for both the seat and back before adding the batting? I’m considering redoing an old chair, too, and am encouraged with your success. Thanks for sharing! Hi Zenda! I did add supports to the seat and the back because there was nothing there! I went to my local lumber yard and bought the thinnest trim I could find, I don’t think it was more then 1/4 inch thick and only about an 1 and 1/2 wide, I was able to cut it with a big pair of wire cutters lol. I just tacked several slats down on the seat and back with little nails and a hammer. I knew the fabric etc would give it a lot of support so it didn’t need to be too serious – so sorry I didn’t get pictures of that! Thanks! Looks lovely! Thanks for sharing at Home Sweet Home! Carla, I know exactly how you feel! This rocker will be with me for the rest of my life, I love sitting in it – it reminds me of my gran every day 🙂 Thank you for coming by and commenting! I love how you transformed the rocker. Love that fabric. Someday I want to learn how to do it. Haven’t made the time yet, but I keep getting inspired by people like you. Thanks for sharing at Let’s Get Real Party. Karen, it actually wasn’t that hard, I was very apprehensive going into it but I think the rocker was probably the easiest project I could have tackled when it came to upholstery! Thank you for coming by! Such a gorgeous redo of that rocking chair! It definitely looks like it took a lot of time and love! It was worth it though – the outcome is gorgeous! 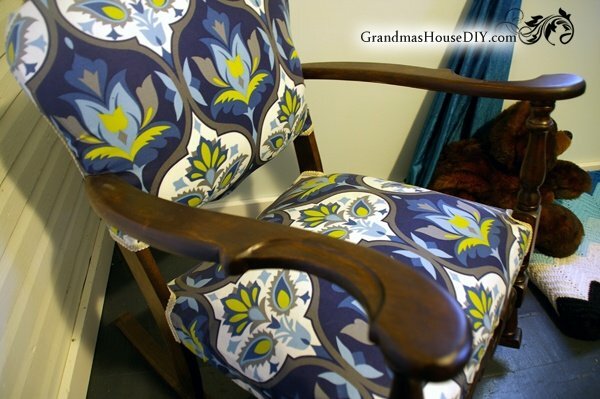 I love how this chair turned out – the fabric was a great choice for the update. This whole post warmed my heart – would you believe that my middle name is Eleonora? Spelled just the same as your grandmother’s name. I don’t see it very often. Thank you for sharing on Family Joy Blog Link-Up Party. Have a great week! My condolences on losing your grandmas. What a great idea about the furniture. Glad you and your man found each other. The rocker looks great, Tarah, and I love that it belonged to your grandmother! Good job and thanks for sharing with us at No Place Like Home. It’s just lovely and what Grandma wouldn’t be proud of that!! I actually like the fabric! You did a great job Tarah! And I like the fabric~everybody needs some color in their life right? I redid a chair recently and when it came time to take the seat off and the old fabric off, I felt the same way. I touched it as little as possible to use it as a template to cut my new fabric, lol. It was so disgusting, which I guess is just the age, but the fillers they used to cover it with, ugh, some of it I had no idea what it was, lol. I’ll have to send you a pic of the finished chair, I love it! And guess where I got my fabric? It’s a fabric shower curtain! Worked out perfectly! Your grandmother would definitely be proud! Candy, thank you so much 🙂 I would love to see your chair! Yup, I couldn’t believe how gross it all was lol I took it a part inside and totally wished I had done it in the garage! Love it Tarah, looks very nice! It sounds like it was quite a project but now look what you have to love and enjoy in your home. Saw your link at your very own To Grandma’s House We Go Link Party #5. This chair makeover is very nicely done. Like you I have very little choice in fabrics where I live, but I like the choice you made. The fabric is bright and cheerful. Strengthening it as you did will likely pay off in many more years of rocking. Thank you so much Leanna! Wow, what a great makeover. I hate all that nasty stuff when you take the upholstery apart but it is so worth it. Thank you! Yeah it was amazingly icky! 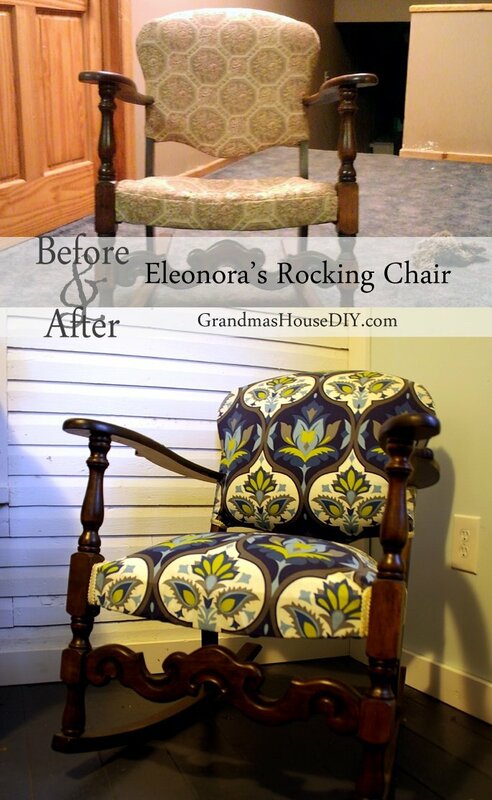 It’s really awesome makeover your rocking chair. Really, love your post. You create a new look this rocking chair. Great work! It is so romantic with the new fabric. My sister has a nursing rocking chair. 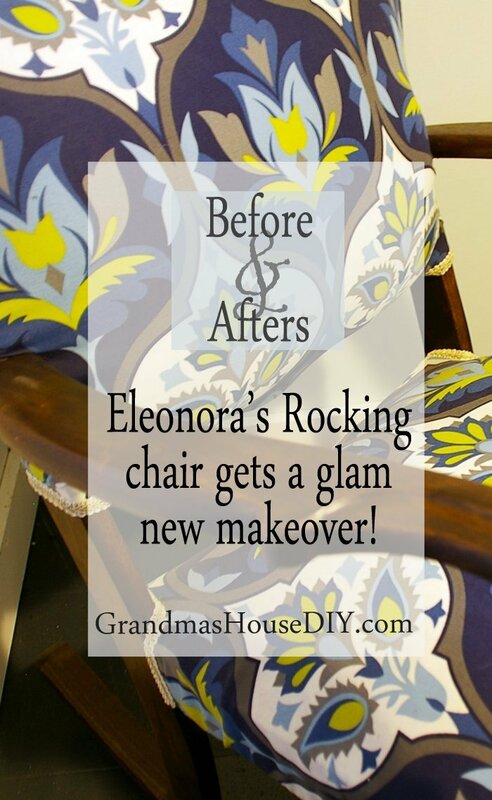 I also create a new look my sister nursing rocking chair.Thank you share an awesome post. Thank you so much Tina!! Thanks again for your nice post and blog, Tarah. The rocking chair turned out great! Thanks so much for linking up at the Friday at the Fire Station link-up! Thank you for being so honest about your struggles and triumphs with this project! So often all we see is a beautiful finished project, and we assume it was super easy and then we get frustrated when we try it ourselves and find it to be much more challenging than we anticipated. You did a beautiful job! The fabric is cheerful, and I agree that the detailing on that chair is unique, I’ve never seen anything like it! Beautiful! Thanks for sharing at My Busy Beehives #beeparty this week! Please come again! Thank you so much Julie! I really try to be honest whenever I post about a project so often bloggers online make it look so easy and that’s normally not the case – DIY can be really hard lol But SO worth it in the end! Thanks Misty! I was on the fence about it initially but that fabric has totally grown on me now! Love that you have been able to give such a beautiful piece a new lease on life. 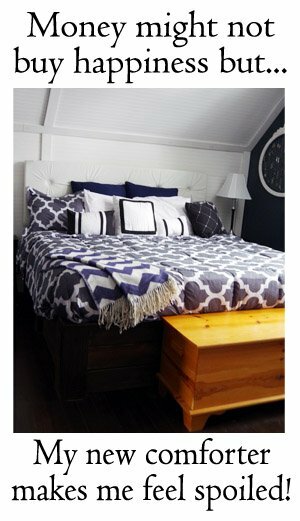 Loved the fabric you chose with the gorgeous wood! So precious also that it belonged to your Grandma! Thank you for sharing it with us over at Waste Not Wednesday and congratulations on being featured! Thank you so much Sam!! What a gorgeous fabric! You have made such a lovely job of this chair! Family furniture is so precious. It really is hard losing those you love so close together. My parents died within 6 weeks of each other and it took me years to come to terms with it. Your chair make over is a lovely tribute to your Grandma. Thank you so much for sharing with us at The Hearth and Soul Link Party. Thank you so much April for your thoughtful comment. *hugs* for what you’ve been through and your loss. I’m very glad I have pieces like this to keep and remember her by. It turned out stunning. It’s not simple feat either. A lot of love goes into reupholstering. Thank you Kristin! This was my first attempt at upholstery and it is definitely not for the faint of heart! Hey Lisa, sorry about that, only one post per week next time! I love the new fabric. Thank you for sharing at The Really crafty link Party. Pinned!